Whenever I visit Cologne, I try to come back to this spot and make this photo. I have probably tried about a half a dozen or more times, almost all during the winter, and have only had one day of clear skies. This was back in 2010 and the photo can be seen here and was Post #1 for my blog. This time around, I was fortunate to be in Germany during summer. Clear skies were abound the week I was there, except of course when I went to shoot this image. Luckily there was a break in the clouds behind the cathedral which made for some drama in the sky. I have seen numerous images of this iconic scene and have taken quite a bit myself. From my experiences, I have two tips for shooting this scene. The first is to not try and include too much of the bridge. If you use a wide focal length, you can get the entire Hohenzollern Bridge in your composition, the problem with this approach is due to this wide angle perspective, the bridge becomes large and the Cologne Cathedral becomes small and off into the distance. 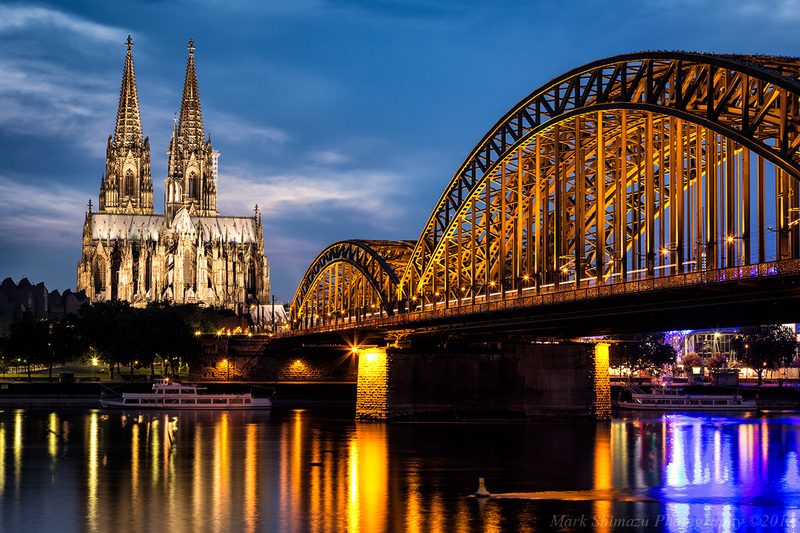 Google images of the Cologne Cathedral and look for those that include the entire bridge and you will see what I mean. The bridge should serve as a leading line into your image and the Cathedral should be the main subject and should take up a good portion of your frame. You can have the Cathedral take a more prominent part of your image by using a longer focal length and compress the image. The second piece of advice I have is to include the purple reflection from the Musical Dome in your composition. This can be achieved by shooting closer to the bank of the Rhein River. The image was shot at f/11 since the bridge was a few hundred feet away and this aperture gave me enough depth-of-field to get everything into focus. The resulting shutter speed was 25s, which helped reduce the choppiness of the river. My kind of shot. Love it! Thanks for stopping by Bryan. From looking at shots from your blog I can see why you liked this photos. A great tip, Last winter i was in Koln to see an exibition of David Hockney…but i haven’t crossed the bridge to see the “Dom” from this side of the river. These two pictures are taken with my little “Fuji x10” camera. Thanks for stopping by. This is really THE classic shot of the Dom and if you ever make it back to Koln, you should definitely try for this shot. Additionally, if you are into panoramas, you can get both the Kolner Dom and Gross Sankt Martin in the same shot from across the Rhein. Beautiful shot, and great advice as always. Your comment with about the wide-angle is well taken. Great contrast in this shot, much richer than your earlier shot. Well done. Thanks for your continued interest in my blog posts Randall. The first photo was made and processed back in 2010 and posted around 7 months ago when I started my blog. I have shot and processed many photos since then and have changed a few things in my workflow. I have debated reprocessing some of my older images (the beauty of shooting RAW) including the earlier Kolner Dom shot, but like the idea of having a history of how my photography has changed or progressed. Thanks Heather. The composition is basically the same in the two images. I have changed a few things in my workflow since the first photo and how I process my images. This is the main reason for the difference. I have debated going back and reprocessing the earlier image, but like the idea of having a history of where my photography was and how it has changed/improved or evolved. Beautiful view and colors Mark. Thanks. All the primary elements are lit up in different colors so it makes for an interesting scene to photograph. Beautiful photo! I especially like the Cathedral in the picture. Thanks Esmee. It is difficult to not take a nice photo of this beautiful scene. Thanks for stopping by Mark and for providing your input on my post. Awesome shot, I was there in 2010 visiting some friends that live in Cologne. I was born in Germany but much further up north before moving to San Diego in the early 80″s. Thanks for visiting and for your comment. San Diego and Germany are certainly very different places. They sure are. I miss the cultural and historic aspect of Europe sometimes. Thanks for stopping by and for leaving a comment Jocelyne. I was very fortunate the overcast sky opened up during the blue hour, or else I may not have comeback with a photo at all. Good one! I saw Cologne only at the daytime. But I’ll come back for the night shots. I love going to shoot cities at night during the blue hour. It gives the buildings life when the lights are turned on. awesome blog!!! I like your guides and the maps!!! For me this is perfect. It’s just the type of photo that I enjoy, both watching and shooting. It’s a great image that you’ve presented here. Thanks for the kind works Cardinal.